Surely there can't be anyone that reads about hunting on the net that doesn't read Norcal Cazadora? I mean, how could that be? So me sticking a link in here, 'hey, take a look at this' - that'd be redundant, wouldn't it? Of course it would. 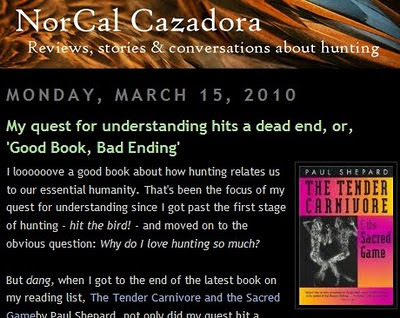 Saying that her latest post - a thoughtful review of Paul Shepard's 'The Tender Carnivore' - was well worth a read would be like putting a post-it note on the front door of the Guardian offices in London that read, 'passers-by might not have heard about it, but this place produces an interesting newspaper'. You are a very funny guy!!! Every post you write is thought provoking, funny, educational or all three. Thanks, Hubert Hubert! It's also worth noting that you left a fantastic comment on said post.